One of the side effects of the financial crisis was that growth cycles across the world that had converged leading up to 2008, became untethered in the ensuing aftermath. We recall listening to an economist in the summer of 2006 wax poetic about how the 66 largest economies in the world were enjoying a historic and synchronized expansion. Naturally, his takeaway was broadly bullish - implying a sturdy and broad foundation was extended beneath the markets. While that was exceedingly true at that time, his observation of the cycle resonated for us in a very different way. If everyone was expanding on the same growth wave, the inevitable contraction would be greatly magnified. We found the statement so poignant, it remained written across the top of a whiteboard in our office for several years. These same wave principals are taught in your high school physics class as a phenomenon known as constructive interference. When two waves of identical wavelength are in phase, they form a new wave with an amplitude equal to the sum of their individual amplitudes. Conversely, when two waves of identical wavelength are out of phase, they cancel each other out completely. 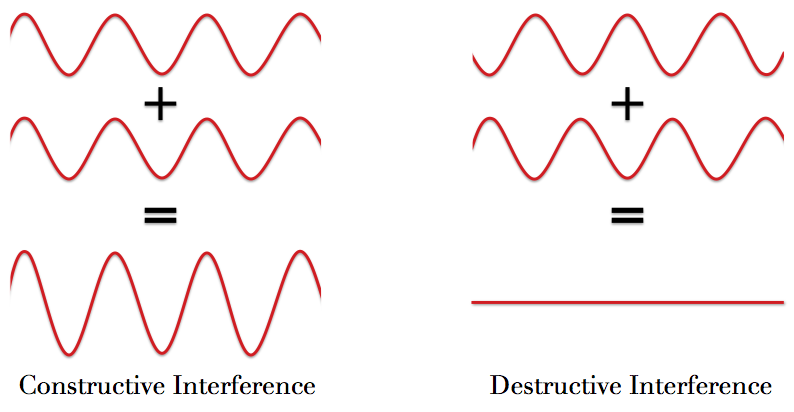 Often, it's a combination of varying degrees of both destructive and constructive interference that determines the composite structure of the new wave - or in this case, the aggregate cycle of the largest economies in the world that had become highly synchronized. Needless to say, our greatest fears in the market were realized just two years later as momentum was translated and magnified sharply lower during the financial crisis. Back in the spring of 2011, we created a video around this concept (see Here) - that also played on the interventive policies that the financial system were increasingly reliant on. For us, Constructive Interference took on new meaning - which was summed up with three progressive assumptions at the end of the video. The current financial system requires Constructive Interference by the worlds major central banks - the Federal Reserve acting as the principal director of policy and practice. Consolidation within the financial sector (i.e. Too Big to Fail) in the last 30 years has enabled central banks with the infrastructure to administer reflationary policies efficiently and with greater efficacy during illiquid periods of contraction. The cumulative effects of Constructive Interference within the financial system has led to increased speculation, frequent financial bubbles and confidence within the monetary system to react (i.e. moral hazard). It should be noted that from the cheap seats of the peanut gallery, we certainly would not have chosen or advocated the TBTF system and policy path that was taken over the past three decades. However, from a pragmatic perspective - it is the framework the system funneled towards and which greatly governs conditions in the markets today. Example being, while it's a step in the right direction requiring banks to significantly expand their capital cushions - for better and worse, we don't expect these enormous institutions to be dismantled any time soon. The dirty little secret: when it comes to administrating monetary policy - the bigger the better, i.e. easier. Subjugating that reality with counterfactual arguments has practically become a rite of passage for many journalists (e.g. Matt Taibbi) and pundits - and painful in the purse for those participants that have carried a strong bias with expectations of an even greater crisis in the future. Ever superior to ones opinion, it simply is what it is. While the crisis exposed the catastrophic dangers of the TBTF model, the massive pipes that were built through consolidation, did help quickly flood the system during and subsequent to the crisis. Would a dendritic banking system have been safer or failed with less collateral damages as the new paradigm? Certainly. Growth would have been constricted, more moderate, less synchronized - and therefore less amplified on both sides of this cycle. However, in many ways it's an anthropologic chicken-or-the-egg debate on markets and capitalism, that we suspect was as inevitable as it was predictable. Free will be damned, we cynically arrive at our collective and predetermined destination. Works for us - and once again on this side of the cycle's trough, we can only speculate as to what the catalyst for the next era of growth will be and when to realistically expect it. Our best guesstimate, however, is that Hansen's transitional divide will extend much longer than most participants expect, as we bounce along the bottom of the trough. We speculated going into this year, the structure and performance extremes that were quickly translated at both the top (12/13') and bottom (7/12') in 10-year yields, might be implying a long-term range was being established as the great inertias of the secular trend in Treasuries entered the trough of the cycle. 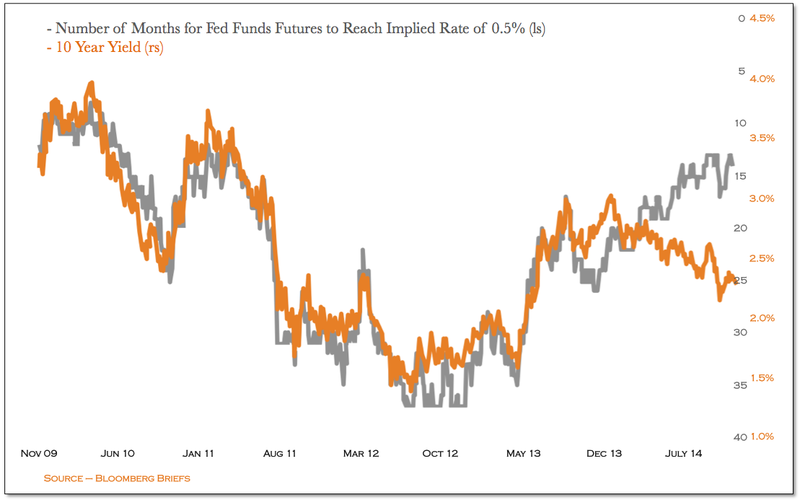 Michael's chart - which shows that the trends in 10-year yields and the number of months in the fed fund futures market to reach the implied rate of 0.5%, were quite correlated going into 2014. Similar to the trend gap that now exists between 5 and 10-year yields, the shorter more impressionable end of the market continues to err on the side of sooner rather than later, when it comes to rate hike expectations over the next year. 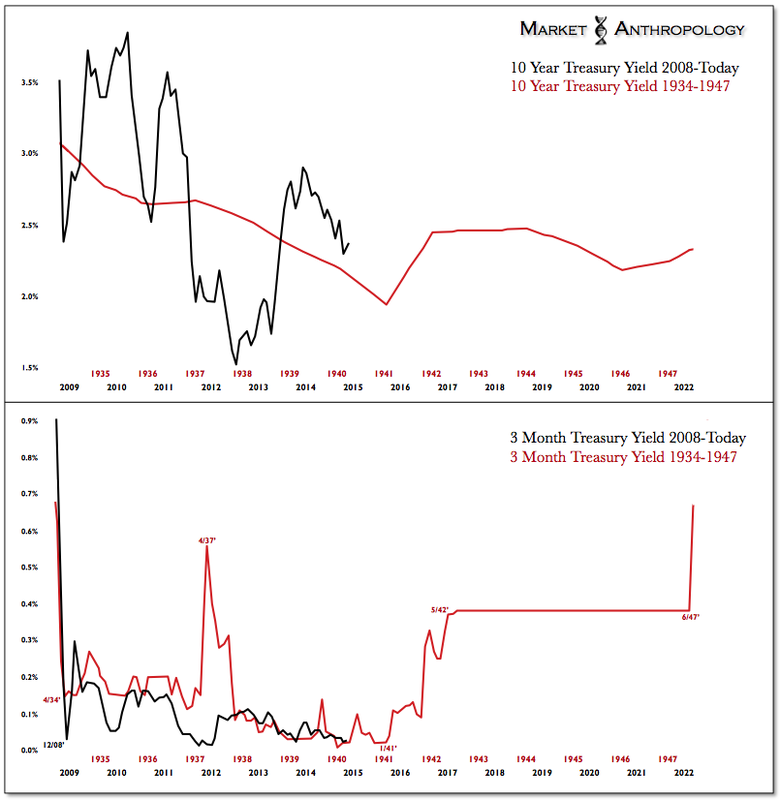 As framed in the Bloomberg chart and illustrated in the roadmap of the last transitional divide (see Here), we believe long-term yields are pointing the way when it comes to rate hikes over the next several years. All things considered, we still like long-term Treasuries - especially relative to the US equity markets. In the equity markets, we suspect it will increasingly becoming a market-pickers market between the four different food groups (US, Europe, China & Japan), with sub-varieties tangent to choice. As mentioned in previous notes, despite instigating the catalyst for the crisis, the US had a head start of working and digging the fire lines, that eventually brought the economic disaster under control first. Relative to what the balance of the worlds major central banks were willing and capable of extending - and with the Fed acting as the policy lead, the differential of capital flows has disproportionally supported our equity markets and the dollar since the crisis spread in the summer of 2008. Are the US markets in a bubble today? In our opinion it's a semantic debate, but one we do believe has greater contrast than comparison between the two previous equity bubbles and their respective downturns. US coasts away from QE, the shear stresses that engendered a broad based positive skew in the US equity markets and dollar, should diminish over time. Although it's a short window to measure, from a relative performance perspective, we have already seen as much since QE wrapped up in the US last month. For everyone in the States and traveling this weekend, have a happy and safe Thanksgiving.